My fondness for facial hair isn’t well documented except by my own hands. Any excuse for an extrapolation of my base hairiness is a good thing, I can’t always wait two weeks to grow a tashe! So facial furniture gave me a reason to expand my natural hirsuteness and see what else people could do with the recipe. I quite like going out in Shoreditch too as you never can tell what you’re going to see or do. For example, as we were waiting outside Hoxton Square a large police van pulled over and three coppers jumped out to accost a skinny jeaned youth, looking to find out what the long black thing in his hand was. Expecting drugs or maybe even a flick-knife, the police seemed relieved to see it was a thin moustache, to the amusement of his plaid shirted jokers. These guys weren’t even with us. Rather dismally, the bouncers at the Electricity Showrooms did not get the memo and decided to be angry and rubbish – proclaiming “no fancy dress” as we tried to sneak in. 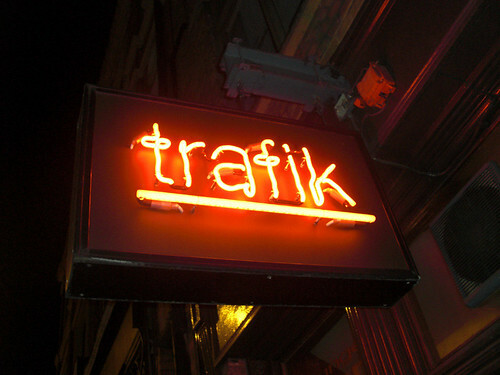 We quickly blew them off, updated Facebook and hoped people would find us over the road at the rather nice bar trafik. In my chefs garb outside trafik I quickly made friends with the manager, mostly because people kept coming up to ask me what ‘is good tonight’ and ‘what are the specials tonight’ before heading in. My Italian presence seemed to channel the hunger for pizza and spicy meatballs through the crowds wandering past. Being a simple man from the country I didn’t realise that half of the enquiries probably weren’t about the food menu at the bar. There were some spectacular lashes, costumes, piercings (although they may well have been real…) and even a real piece of ‘facial furniture’ in gold and black! The stickers and cards we’d brung made friends with everyone, but I think the marker pens were the most popular. A group of ladies allowed me to demonstrate on one of their number an ‘arm-tattoo’ and they proceeded to draw on themselves and other randoms throughout the bar. I managed to escape with only a red pen mark to the face and a green inky legend on my apron proclaiming “Laura loves IT”, I never did find out which branch of Information Technology she was into or if she was a Mac or a PC. 01. Place After-Eight on forehead. 02. Wiggle head and use tongue to get chocolate into your mouth. 03. Do *not* use hands to move chocolate. 04. If chocolate falls on the ground, you lose. If it goes in your mouth, you win! 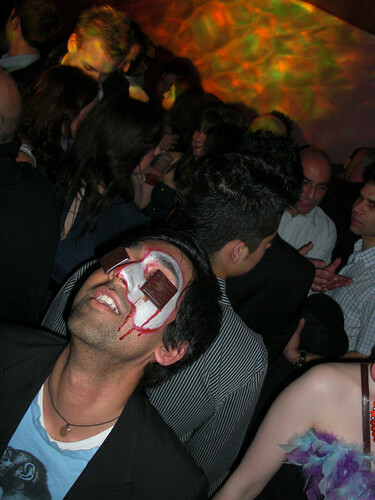 After Anup proved himself the first place sticky-chocolate face of the night, he foolishly tried to do two at once. 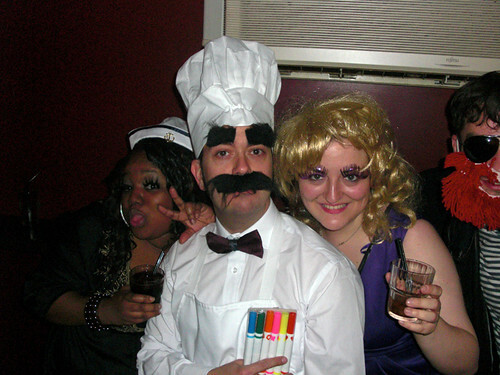 After hearing seventeen subtly different versions of Lady Gaga’s songs at the club we dispersed into the night parading the giant Fork and Chef through the various fast food outlets of Old Street. The rubber chicken tasted chicken flesh for the first time and we made friends with the ugliest kebab shop owner mankind has ever known. 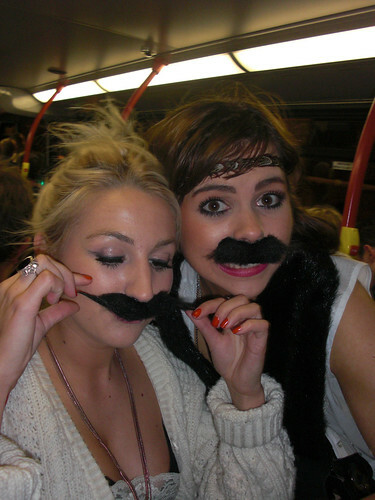 On the night bus we shared the furry bounty of the night with different people heading south of the river. One emotionally clad girl proclaimed that she would name her first-born (she wasn’t pregnant) after me as she loving caressed her new tashe in her bus-window reflection. It’s kind of comforting to know there will be another Giacomo in the world one day.